“The Stilt”, a Finnish overclocker, has pushed the A10-6800K (AMD’s flagship APU) to just over 8.0GHz. Liquid nitrogen was summoned for the operation with the chip running on a voltage of 1.992V effectively producing a temperature of -185°C. To attain the final clock speed of 8000.48 MHz, The Stilt set the base clock at 126.99 MHz with 63.0x for the multiplier. The operation attained the final speed with all of the APU’s cores running simultaneously. 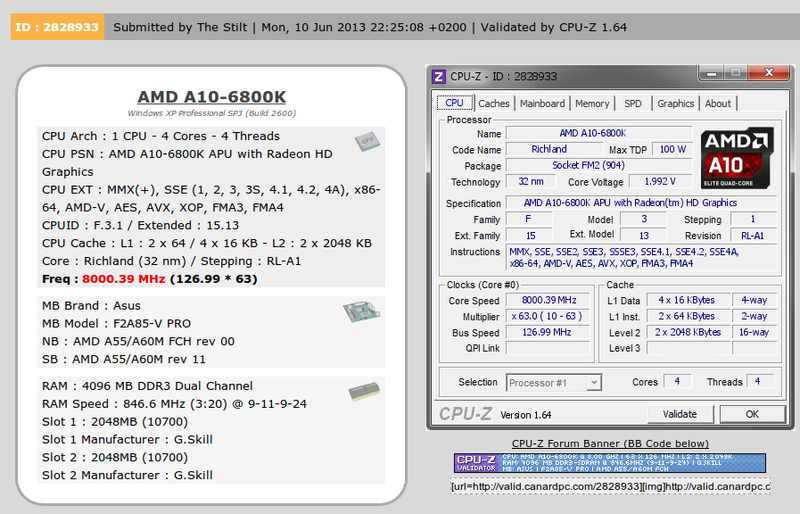 In other cases only one of the cores is active for such an operation, all the others are disabled. The setup included an ASUS F2A85-V PRO motherboard and 4GB of G.Skill DDR3 RAM which ran at the effective speed of 1693.2MHz.